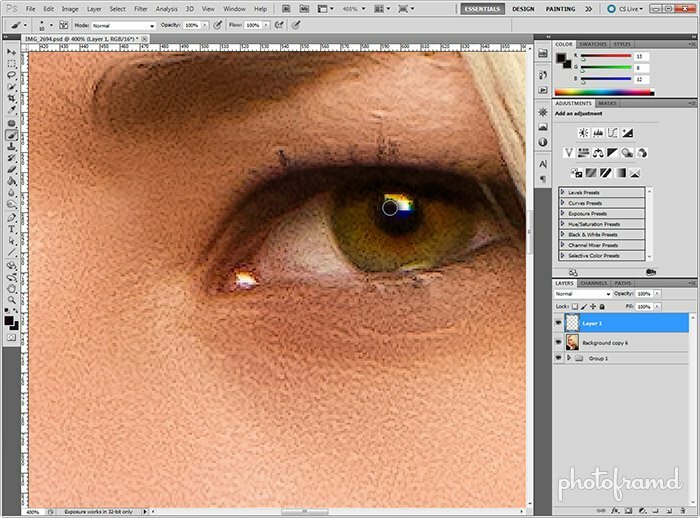 If you have been reading my blog for a while, you know that I prefer to create realistic enhancements in Photoshop CS5. It’s easy to make something look like a Photoshop fake (or worse a Photoshop disaster). The art is in creating something that looks real. I have been experimenting with Topaz Labs new plugin called Star Effects. It’s incredibly easy to add a star highlight to any light source and make them POP. But, I wanted to try using it with portraits for a realistic enhancement. After some experimentation, I finally created the right glamor look (in the above image). 1. 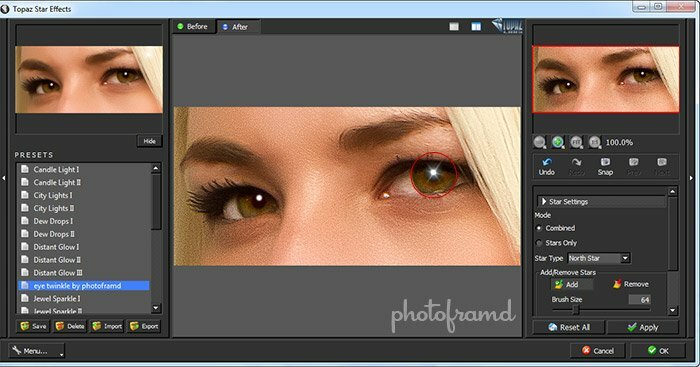 Quick and Easy Portrait Retouching. Everyone can benefit from a little Photoshoping … even models. 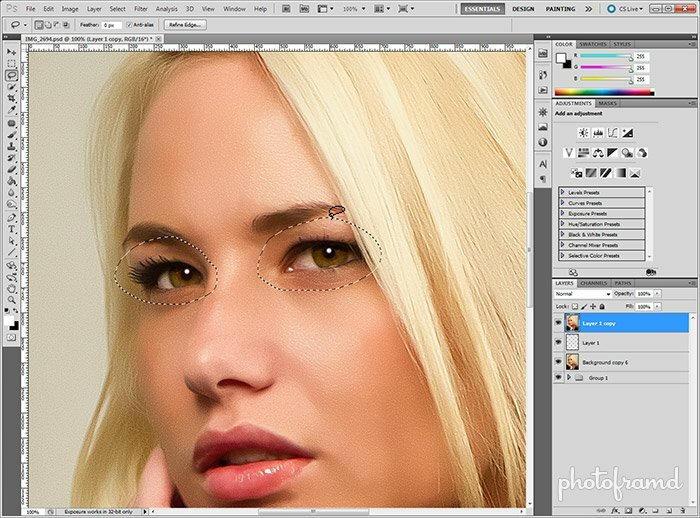 The above before and after results were achieved in under 5 minutes using the steps in my previous tutorial – Photoshop CS5 – Quick and Easy Portrait Retouching. Again, the results are realistic glamor enhancements without looking fake. The model was shot using a large rectangular softbox. Since I am planning on using Topaz Star Effects, I need to replace the existing catchlights with ones that work best for the plugin. Star Effects works best with a round light sources of pure white. My first step is to add a new layer in Photoshop and cover up the existing highlight. (The steps from my portrait clean-up are hidden in Group 1. I always keep source files!) 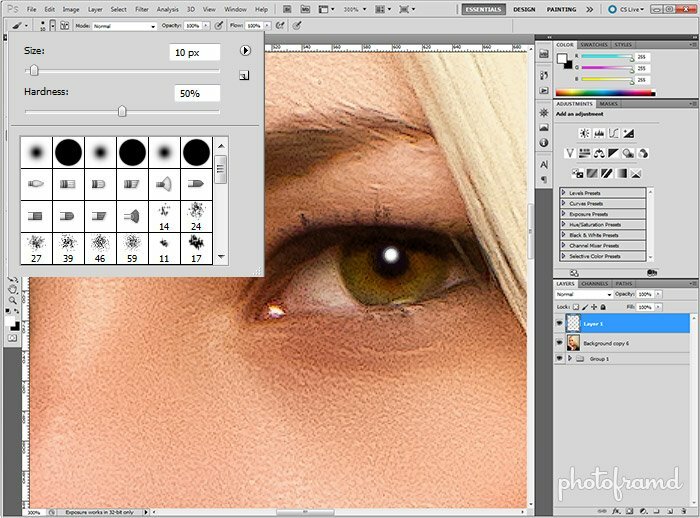 I used the Eye Drop Tool to sample the pupil color and painted on the new layer using the Brush. Depending on your photo, you may want to use the the Clone Tool or the Healing Brush. I used a separate layer in Step 2 for a reason. It is very easy to make a model look cross-eyed if the catchlights do not match. By turning the layer on and off, I can position the new catchlight in the best location using the real catchlight for reference. The size of the catchlight is also important. Again, I used the real catchlight for a reference. Using a Brush of 10 pixels with a 50% Hardness and pure white, just one click in each eye was enough. Note: In the above photo, the softbox was directly in front of the model and the real catchlights were the same size. Using the existing catchlights is very important. Depending on the location of the light source, it may be more natural to have the catchlight in one eye be slightly smaller than the other. 4. 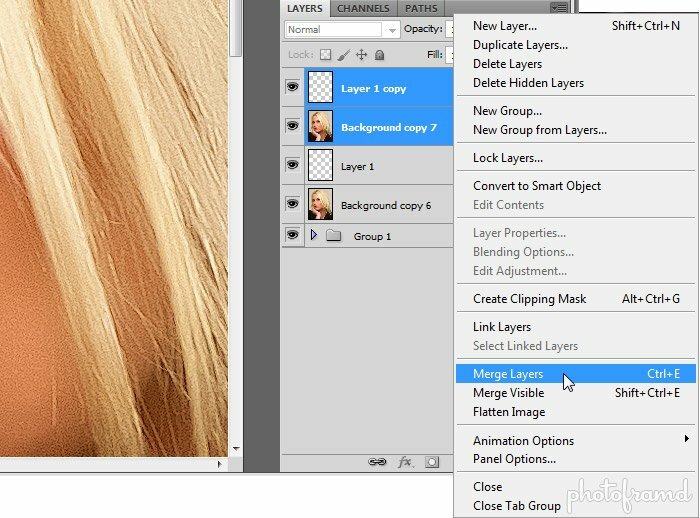 Duplicate and merge layers. Once you are happy with the new catchlights, it’s necessary to duplicate the layers and then merge them. 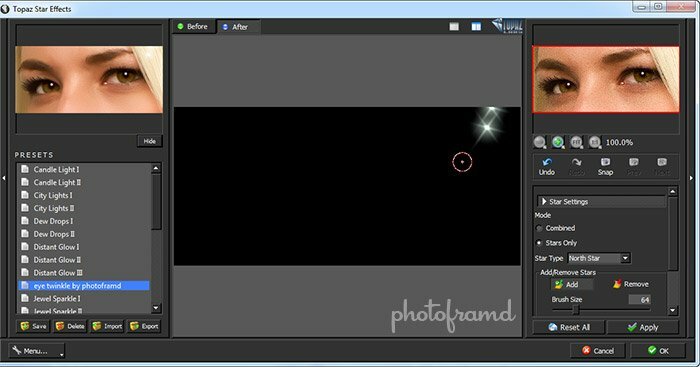 Star Effects does not work with transparencies, so the plugin needs a solid area to apply its effect. Also, I wanted to keep the original layers just in case I later wanted to reduce the opacity of the Star Effect or start over. 5. Isolate the area for the effect. Star Effects will attempt to analyze the whole image. To speed things up and isolate the plugin to the desired area, I used the Lasso Tool to create a selection identifying the target area for the plugin. 6. Remove wrong light sources. Under the Star Settings tabs, click the Stars Only option. It will display the location of light sources which Star Effects has identified. Since Star Effects did not identify the correct light sources (the new catchlights), I needed to remove the wrong ones. Under Add/Remove Stars, I selected the Remove Brush and just clicked on the stars to remove them. 7. Eye Twinkle by Photoframd. Finally, we get to the good stuff! Click here to download my zipped Preset for Star Effects. After you unzip the Preset, click the Import button in Star Effects and select the unzipped file. With the Preset in place, I used the Add Brush with a Brush Size of 64 and clicked on the new catchlights. You can tweak the Preset as necessary in the Main Adjustments tab by adjusting the Size, Angle, Spread and Luminance. I get the same thing… can’t download your preset:( the link is not working! Since the link is not working could the setting values used in Star Effect be posted ? Sorry!!! The link has been corrected. The link works fine now. The file is a compressed Zip file. You must Unzip it first and then import it into Star Effects. File won’t unzip on my iMac? is there a workaround? That sometimes happens with the presets. Close Photoshop and then relaunch Photoshop and Star Effects. Also be sure that you installed the 1.1 update of Star Effects. The original release had a problem with presets. After my initial attempt to import the unzipped file and having it run but not seeing the preset listed on the left with all the other presets, I downloaded the zip file again and also downloaded Star Effects again (it was the same current ver as I already had tho)- as I still did not see the preset listed I launched a fresh Photoshop Session and tried to Import the unzipped preset again and got the message that it had already been imported – yet still did not see its name in the list. I changed the name of the unzipped preset and tried to import that – the import worked and listed it in the presets with the author’s original title in place. Computers do strange things for sure. Thanks for sharing your preset. I have had this problem before with Topaz plugins. If there is a problem handling presets and you try importing a preset, Topaz will put the preset in the wrong place. Unfortunately, it knows it put it somewhere and will generate that message that it already imported the preset. You need to find the “real” folder which holds the Topaz plugins and look for the problem preset. If you delete the preset and then re-import it (when the plugin has been fixed), it will correctly import the plugin and everything is fine with the world again.